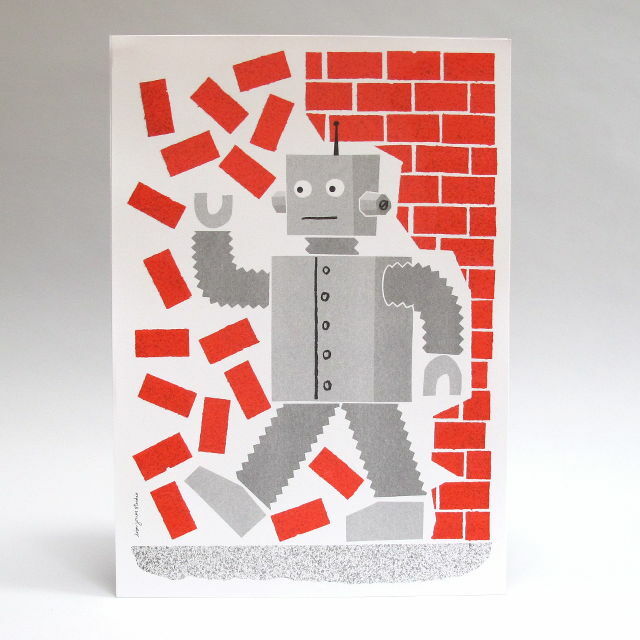 A brightly coloured print of a robot walking through a wall – or at least I presume he is walking through it rather than trying to repair it. These prints are ideal for all rooms of the house; from childrens’ bedrooms to kitchens, studys and living rooms. 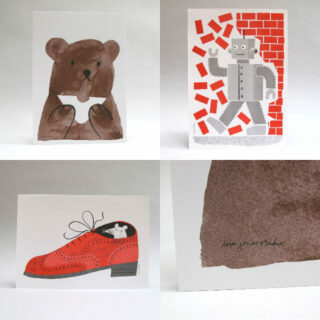 We also have more prints by Lisa available: A-Z Worms, Blackbird, Brogue, Bubblegum Bear, Butty Bear, Cat Nap, Circus Elephant, Dog Tired, Elephant & Tiger. Lisa Jones Studio actually comprises both Lisa Jones and her partner Edward Underwood; they live and work in Lewes, East Sussex in an old windmill. I have known Lisa for far too long; when we first met her range of cards was in its genesis, comprising screen printed cards with the addition of hand stuck googly eyes. Together with Edward they have since massively expanded their range to include homewares, clocks and some commercial work for companies such as Paperchase, Habitat and Melt. Lisa Jones Studio products are sold in some of the finest shops and museums across the world.